This is the third of a five-part series explaining, in remarkable detail, how Obama and the Democrats came to pass health care reform. (Click here to read parts one and two.) Be sure to come back tomorrow for the fourth installment, which reveals how Obama saved the House bill and what Olympia Snowe really wanted until the very end. It was Henry Waxman, chairman of the House Energy and Commerce Committee, who had tried to get tough with the manufacturers of biological drugs. He was thrilled to be pursuing health care reform, a lifelong crusade, and he was an unabashed fan of the president. But few people in Washington were more upset about the deal Obama and Baucus had cut with the pharmaceutical industry—and the way it seemed to undercut the progress Waxman and colleagues were making. Such progress had not been foreordained. While Speaker Nancy Pelosi committed herself to health reform early, her lieutenants had reservations. After the presidential election, Jim Clyburn, the majority whip, told CNN he thought it better to concentrate on incremental reforms. Charles Rangel, who was then chairman of the Ways and Means Committee, asked Baucus during their weekly lunch why on earth he was spending so much time on health care—there was no room for tackling comprehensive reform, he said. The House, no less than the Senate, had its own warring chieftains. Three committees laid claim to jurisdiction over health care: Rangel’s Ways and Means, Waxman’s Energy and Commerce, and George Miller’s Education and Labor. But, more than any recent Democratic leader, Pelosi had asserted her control over the institution, easing out unfriendly chairmen (John Dingell) and replacing them with loyal allies (Waxman). She also believed in deadlines. When she made clear her ambitious timetable, the three chairmen realized they’d have to divide the work of health care legislation. They’d collaborated like this on the Recovery Act—proof that once-contentious relationships, particularly at the staff level, were improving. They started calling themselves “Tri-Com” and, eventually, got their own tote bags, complete with a Tri-Com logo. Of course, cooperating was one thing. Complying with Obama’s imperative to cut costs and make reform pay for itself was quite another, particularly given the way calculating cost works on Capitol Hill. Experts had identified ways to save money in medical care—like creating electronic medical records or punishing inefficient hospitals with lower Medicare payments. But the official arbiter of costs in Washington is the CBO, whose skeptical economists were unwilling to certify that such changes would significantly reduce medical spending. Obama’s advisers had their own ideas about cost control, chief among them an independent commission that would help calibrate what Medicare pays for treatments. The idea was to take those decisions out of Congress—which, naturally, didn’t sit well with many members. The administration also seemed intent on keeping the price tag of reform in the neighborhood of $1 trillion. It had identified about that much in new revenue and spending cuts to offset the amount, which was nice, but many House members felt it was still not enough to finance an appropriately protective insurance system. Eventually, the House chieftans decided the best strategy was to follow their instincts, keeping within hailing distance of the administration’s guidelines but not strictly hewing to them. That meant, among other things, extracting more money from the drugmakers. “I expressed my unhappiness with those deals,” Waxman says, “and I made clear I didn’t feel bound by them.” And, by June, the Tri-Com had released their bill. But, while the Obama administration said only good things in public, the CBO was less sanguine when it issued its estimate in July. It projected that the bill would run a deficit of more than $200 billion. One reason was that the House had gotten cute with the numbers: In the final year of the ten-year window, money going out was higher than the money coming in. That meant deficits might be even bigger in future years. The tension finally blew up in Waxman’s committee—in which Southern, rural, and more conservative Democrats had more representation and in which Waxman, for all of his smarts and savvy, had less crossover credibility than Dingell once did. The flash point was the public insurance option. Leadership and House liberals wanted a “robust” version of the public plan, one that paid for medical care at or near the rates that Medicare did. An early CBO estimate suggested that a public plan with (slightly modified) Medicare rates could save the government around $150 billion. But that money would come out of the health care industry, which prevailed upon ideologically sympathetic (and campaign-donation-dependent) lawmakers to intervene. They blocked a bill until Waxman fell back to a plan that would negotiate payments with the providers of care just like private insurers did. With that concession, Waxman got his bill out of committee, just as Miller and Rangel had done days before. It would have been an occasion for celebration among reformers, if they weren’t so worried about the Senate. Max Baucus was in a familiar situation: Getting lectured by angry members of his own party. But, this time, it wasn’t just Senate liberals. It was the majority leader. And the speaker of the House. And the president. They were meeting in the Oval Office, and the subject was Baucus’s halting progress. Pelosi thought Baucus’s pursuit of Republicans was pointless; they wanted to kill the bill, period, and, by dragging out the negotiations, they might just succeed. Reid, though generally inclined to give his committee chairmen room, was coming around to the same conclusion. Obama was, too. Winning over Olympia Snowe was one thing; the administration had zeroed in on the Maine Republican as its best hope for Republican support. But Chuck Grassley, the senator on whom Baucus was spending the most energy? Everybody but Baucus was giving up on him. Grassley didn’t blame Baucus personally—and told his friend that he wanted to keep working on reform. But now, he wanted some assurance that, on the major issues, the deal he cut in Finance would withstand pressures from the left on the Senate floor and in conference negotiations with the House. And he didn’t want to be alone. He needed to be one of several Republicans voting for the bill—and Snowe, whom many Republicans regarded as too liberal, didn’t count. 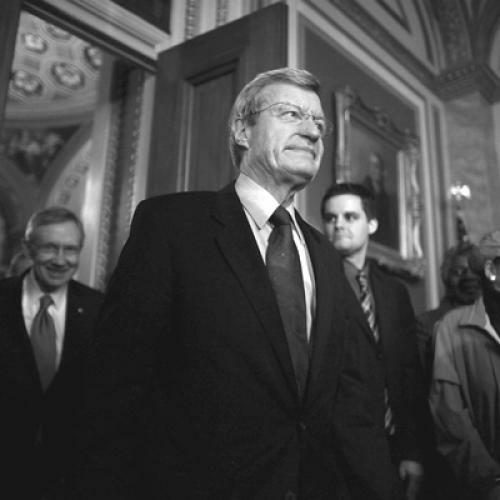 Reaching across party lines was Baucus’s specialty—and, early on, he had Obama’s enthusiastic support. For Obama, bipartisanship was partly a matter of principle. He had pledged to work with Republicans, and, at least early in the term, he believed that a handful of Republicans would be willing to join him on legislation vital to the country’s future. Obama also understood the math—and that the surest path to 60 votes went through Finance. But, with the Republican leadership making clear it wanted no piece of meaningful health care reform, few Republicans were interested in negotiating seriously. The logical target would have been Ted Kennedy’s old friend, Orrin Hatch, who had also collaborated on CHIP. But Hatch was openly blasting Kennedy’s HELP staff for pushing for a “partisan” bill, in a way their ailing boss supposedly would not have, so Baucus turned to Mike Enzi of Wyoming. The thinking was that Enzi, like Hatch, sat on both Finance and HELP—and was a Kennedy friend, too. Enzi told Baucus he was willing to talk, and, based on that agreement, Baucus convened what eventually became known as the “Gang of Six”—Enzi, Grassley, and Snowe for the Republicans, Baucus, Jeff Bingaman, and Kent Conrad for the Democrats. But Enzi proved early he was an unlikely target. (“Enzi and Kennedy are friends, great, they both drank,” quips one senior administration official. “That doesn’t mean he’s going to make a deal.”) Baucus himself learned this the hard way in late July. Baucus asked the Gang of Six if, in lieu of an elusive agreement on legislation, they’d sign a letter attesting to progress and promising official hearings by September 15. Enzi refused. Check back tomorrow for Part Four, which which reveals how Obama saved the House bill and what Olympia Snowe really wanted until the very end.